At UNIQUE Custom Pools we are committed to providing our clients with the highest quality construction process and workmanship in the industry. In addition, we are committed to offering an equally high level of communication so that clients always know the status of their project and what to expect in the coming phases of construction. Our 14 step custom pool construction process sets up apart from other contractors from day one and ensures that our clients receive nothing but the highest quality finished product. To learn about our 14 step process in more detail, schedule a free consultation with one of our design specialists. Prior to construction, your new pool is reviewed by our design and construction team, CAD Department, Engineers and the UNIQUE Owner, Chris Griffin. All of the construction notes are carefully put on the plans for permitting and for use by our crews. Permits are then obtained. This process can take anywhere from 1 day to 4 weeks, depending on the municipality. 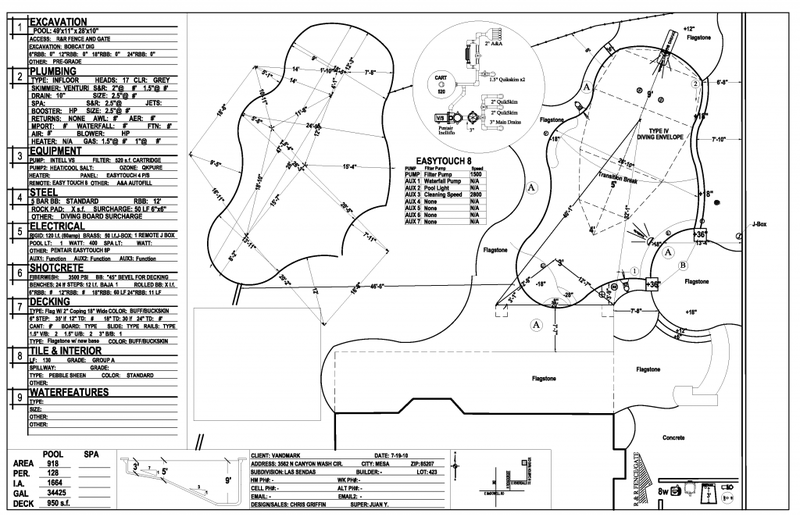 With engineering and permitting completed, all of the design plan is transposed to your yard. This allows homeowners the opportunity to see the scale and location in their yard before any excavation begins. Final changes and alterations can be made at this time. This process can normally be completed in just a few hours. 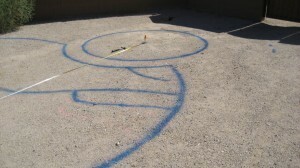 All of the details of your pool design and the services for your pool will be painted on the ground, to scale, for you to review. This is the first step in the actual construction process and often involves the use of heavy equipment to dig the pool and remove the excess soil from your property. This process can range from 1 to 3 days in most cases. Bobcats, backhoes and other equipment is brought into your yard to dig your pool and remove the excavated soil in a timely manner. Plumbing is one of the most critical aspects of UNIQUE pools. Because our primary focus is over-sized plumbing, hydrology, and pump efficiency, we take careful precautions during this phase. Pictures are taken throughout this phase of construction for documentation purposes. 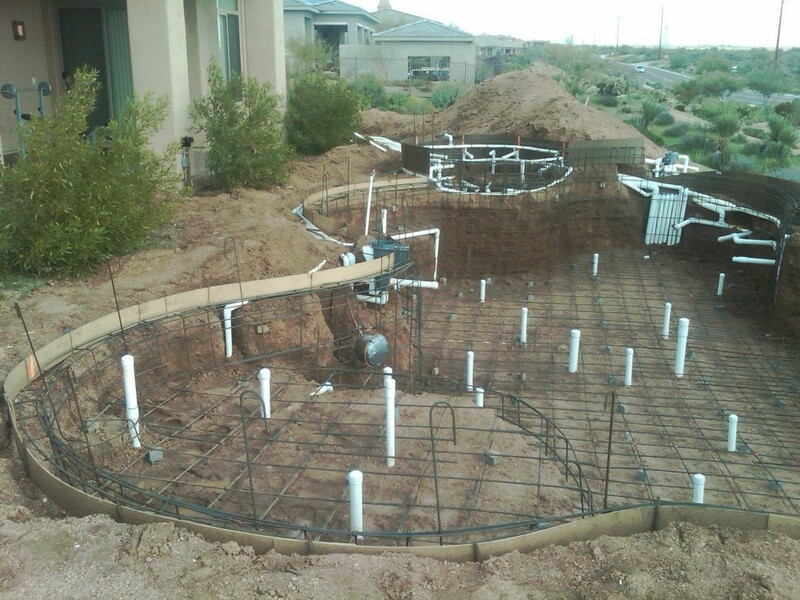 Plumbing most custom pools can be completed in 1 to 2 days. 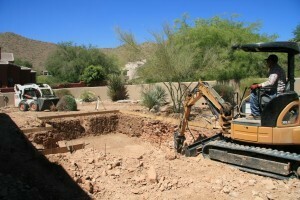 The plumbing is run into the excavated area that will become your pool and stubbed up. These pipes will later be used for your in-floor cleaning system as well as the drains. The structural integrity of the pool is defined here in the “STEEL” phase of the project. The rebar shell of the pool is made of 3/8″ rebar at every 12″ on center or more if required by engineers. UNIQUE uses additional steel in all of our pools with our 5-bar bond beam and center shell reinforcement for longer and larger pools. The steel phase normally lasts for 1 to 2 days. 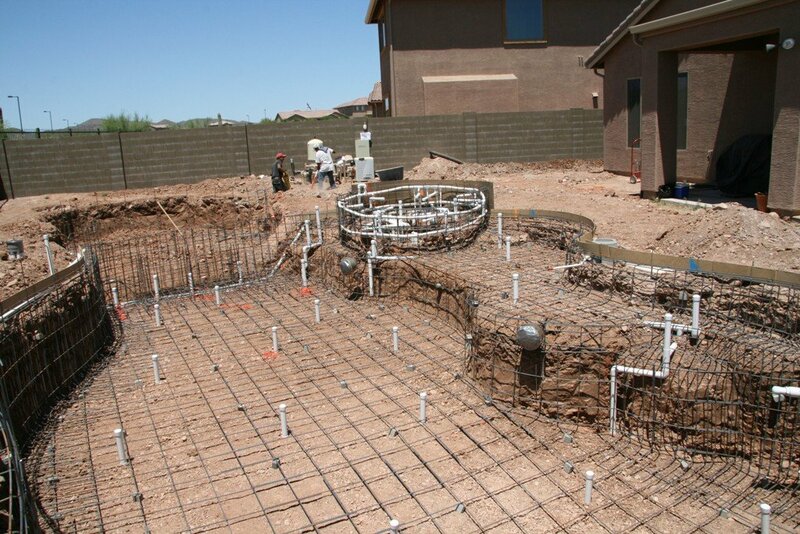 This rebar mesh system is what provides the structural integrity that allows UNIQUE pools to last a lifetime. 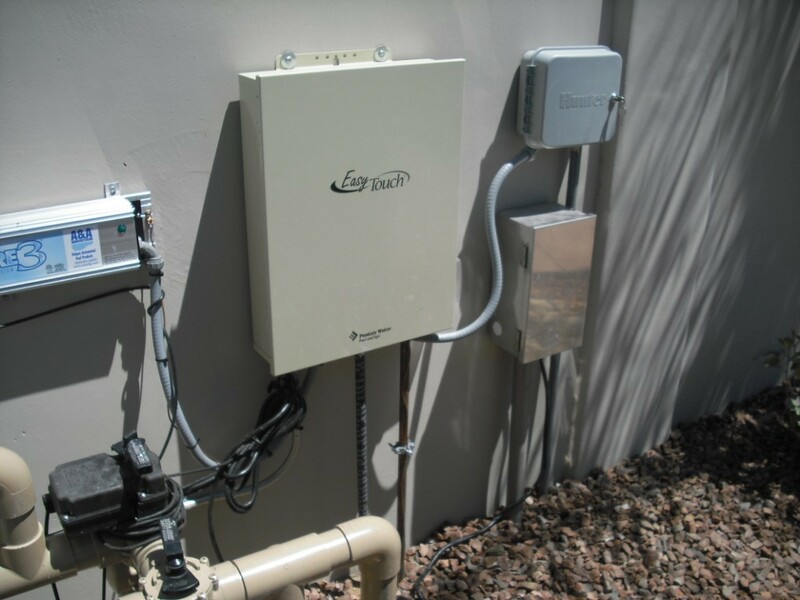 During the electrical phase, all of the electric service and lines needed to operate the pool pump, lighting, and other electric components are installed. Our designers also make sure we can integrate your pool electrical service with your landscape features which require electrical such as Outdoor Kitchen and Barbecue outlets, Ramada lighting, and landscape lighting. Electrical can often be completed in 1 to 2 days but more intricate designs and integration with other outdoor features can increase the length of this phase. All of the electrical components of your pool are mounted at the pool equipment. This can also include additional wiring for landscape lighting, features in your outdoor living area or outlets for future use. This is when you really get to see your pool begin to take shape. The steel cage that was created is covered with 6″ – 8″ of solid concrete. 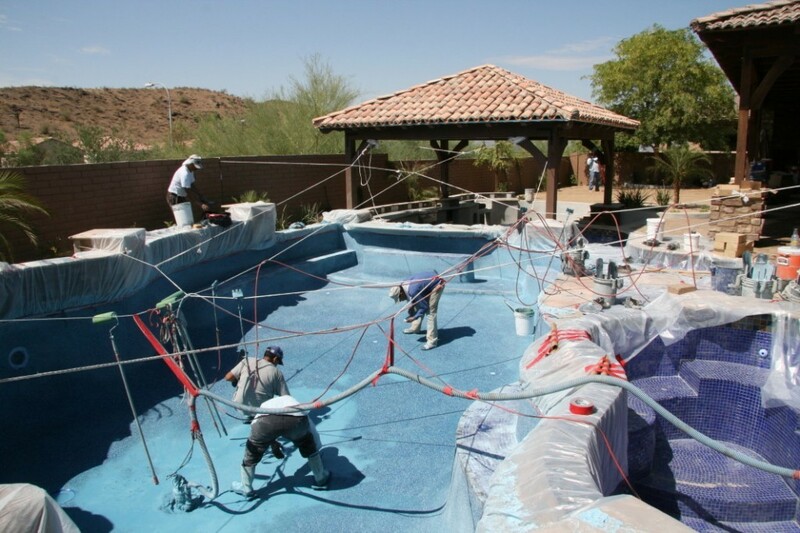 UNIQUE uses only the highest strength concrete with fiber-mesh in all of our pools. 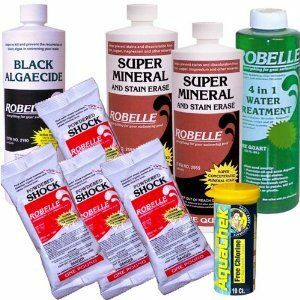 This ensures that your pool will truly last a LIFETIME. The shotcrete is completed in a single day. 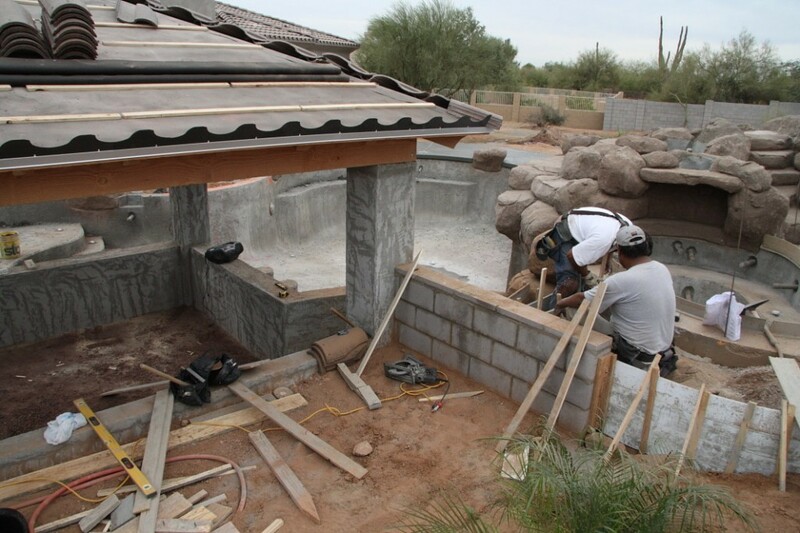 Shotcrete is applied to the steel cage to form the actual shell of your pool. This is when your project really begins to look like a pool! Depending on the type of deck you select, the waterline tile will be installed right before or after your pool decking. At this same time, out craftsmen will also set the tile on other features in your project such as the outdoor kitchen countertop or on a tiled water feature. Tile can last for 2 to 5 days on average. Waterline tile and water feature tile installation is coordinated with the installation of your pool decking. In some cases, the decking is installed first, but in other cases the tile must be installed first. Your designer will be able to tell you the progression of your specific selections. Water features can be natural rock, artificial rock, block or stone. 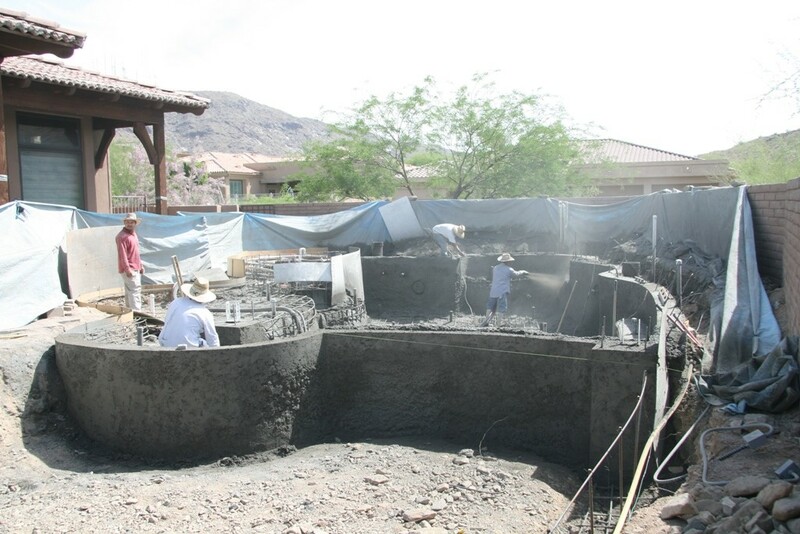 UNIQUE’S pool construction process integrates our water features at different points throughout the project depending on the type of feature. A properly designed and well-built water feature is key to any new swimming pool and spa project. 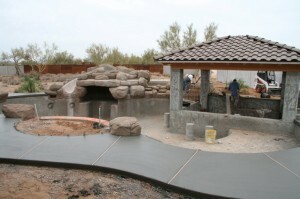 Depending on the size, location, and material, construction of a water feature will require 1 to 3 days. Grottos and waterfalls are often build with large surface select boulders or artificial rock. 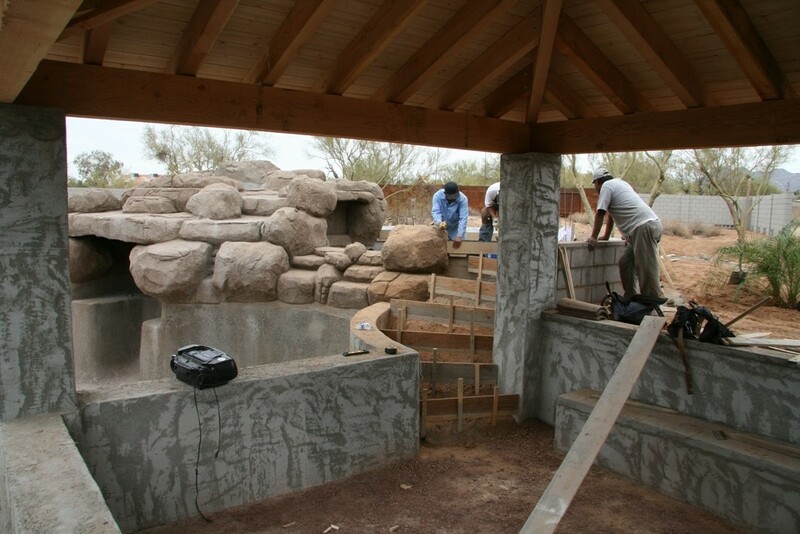 Our staff of skilled masons will custom build the water feature of your dreams. UNIQUE’S Landscape Division completes all of our pool masonry and hardscape projects. 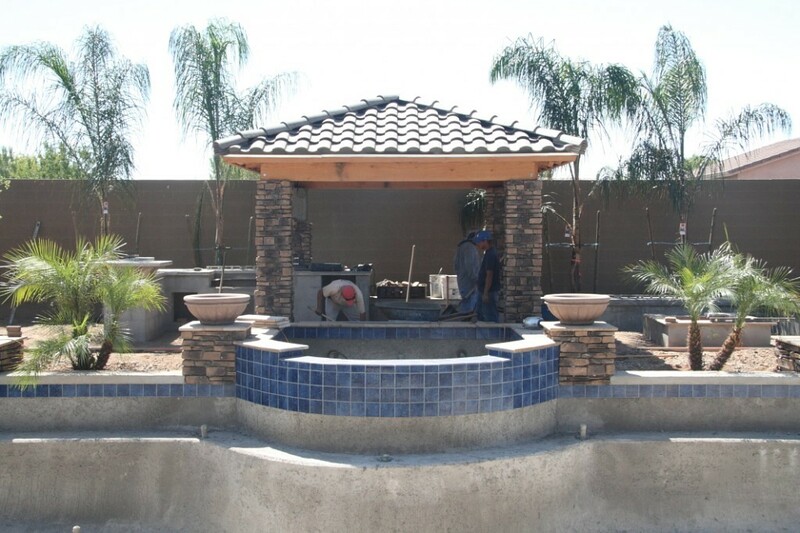 Our staff of masons build all of the block water features, walls, BBQ islands, fireplaces, fire pits and more. This is usually followed by an application of stucco, stone, and paint. The scope of the project will determine the length of time required to complete the work but most projects range from 2 to 10 days. The UNIQUE Landscape division will arrive to build all of your structures including walls, BBQ Islands, fire pits and other outdoor accents. At this point, your project is coming together and we are ready for the inspection to be certain that your pool meets all requirements, codes, and regulations of the city/county. It normally takes a day or 2 for the city or county inspector to come out and complete his or her inspection. The final construction phase is the application of the pool’s interior finish. This signifies the completion of your UNIQUE pool. While the actual application of the pebble or plaster only takes a day, there are several processes which follow to finalize the interior of our pools. After an acid wash and light polish on day 2, we will start filling your pool. Depending on the size of your pool, this can take 1 to 3 days. The installation of your pools interior surface means that we are very close to the completion of your UNIQUE custom pool. The installation is relatively fast but there are critical processes to follow to ensure a durable and perfect interior finish. Your new swimming pool is now complete but showing you how to use it takes a few days. First, chemicals are added and the pumps are started (STARTUP). After everything is perfect, you get a few hours of lessons in our very own Pool School. We can also explain to you the benefits of using the UNIQUE pool service division to maintain your new pool. We will spend a few days getting your pool water perfectly balanced and ready for you to enjoy before we begin your tutorial on pool care. We will also explain our pool service agreement if you are not interested in maintaining the pool on your own. STEP 14- TIME TO ENJOY YOUR CUSTOM POOL! It has been anywhere from 30 to 60 days since the beginning of your custom pool construction process. But now you are the proud owner of a UNIQUE pool that is designed and built to last a lifetime. It is now time to begin to enjoy your UNIQUE custom pool and all of the features that you have selected to create your dream outdoor living space. We thank you for your business and look forward to hearing how much you are enjoying your oasis. These 14 steps and our dedication to communication and customer service are what sets UNIQUE Custom Pools apart from all of the other pool contractors in the valley. We welcome your call to schedule a free consultation with one of our pool designers to learn more about our company and how we can turn your dream pool into a reality. The perfect Arizona pool package includes 5 must-have items. This perfect UNIQUE pool looks amazing thank to these five features. As summer approaches, many homeowners are deciding that this is the year they are going to treat themselves and their family to a new swimming pool. But there are so many options and decisions to make that many homeowners become overwhelmed and let another summer slip by without getting their dream pool. However, there is a simple solution to this huge dilemma. All homeowners need to do is be sure to include the following five must-haves in their pool. These items might sound confusing or even unnecessary, but all of these five must-have features will ensure that you and your entire family will enjoy your Arizona pool package for years to come. After all, your goal is to create a fun and relaxing swimming pool to enjoy this summer and every summer, not to add to the mounting number of items on your to-do list each week. Automation provides peace of mind, so owners know that their pool water will be safe and ready for fun all day every day! 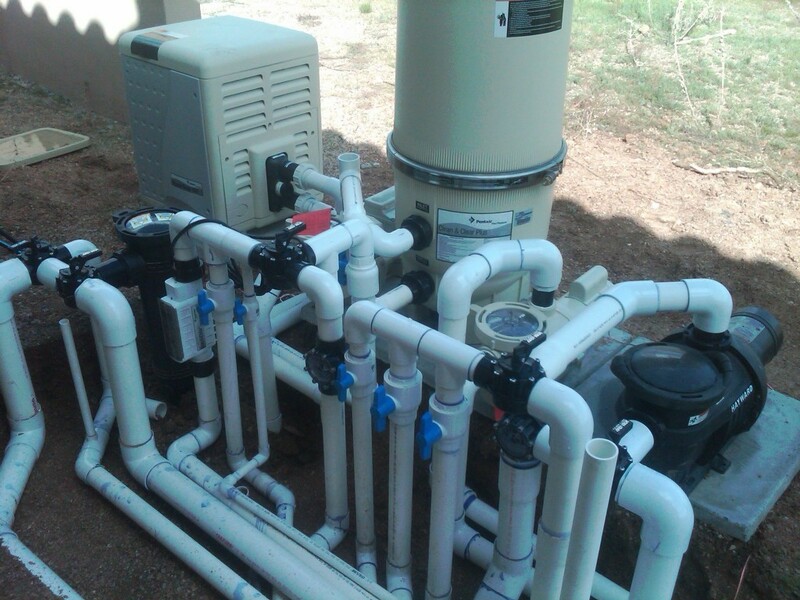 Adding an automated water treatment system of technologies to your Arizona pool package means that you never have to worry about the pH or chlorine level in the pool. The smart technology of these systems determines, in real time, the greatest need of the pool water and how best to correct it. An analysis of the water can trigger the function of the salt chlorine generator or liquid chlorine as well as additional filtration so that your pool is always ready to enjoy. Including an in-floor cleaning system will eliminate the other most time-consuming portion of pool maintenance. 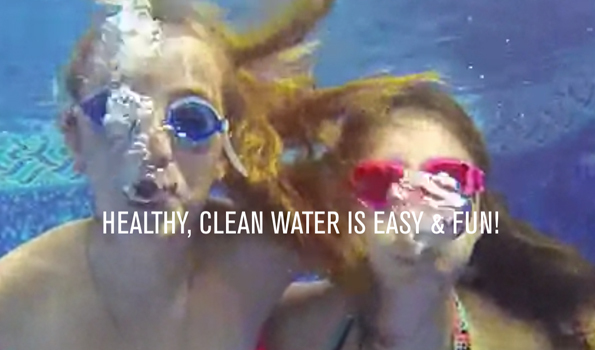 The cleaning heads will function on a time and keep your pool clean and ready for you to enjoy. As the sun sets, your pool will become the jewel of your outdoor living space thanks to lighting and jet features. In addition, lighting will ensure guests can easily enter and exit your pool without the worry of an accident. As you are thinking about your dream pool, be sure to include all of the great features that will add to your fun and enjoyment. A great slide or baja step will provide hours of fun for your kids and will also be fun for the adults. A natural stone waterfall makes a great focal point for your entire outdoor living area and will provide the very tranquil sound of moving water to enjoy even when you are not in the pool. And to add to the impact of your entire outdoor living space consider adding water jets to your pool deck. And adding lighting to the pool is certain to enhance its functionality at night and turn it into the center of attention as the sun goes down and the lights show begins. Staying active and enjoying the outdoors is a great benefit when living in Phoenix. The mild winters in Phoenix mean that you can enjoy your pool year round as long as you plan ahead and add a pool heater to your pool package. Even though summer is just around the corner and you are thinking about cooling off in the refreshing water of your new pool, don’t forget that the cool winter weather will return. And without a pool heater, you will only be able to look longingly at your pool and remember all of the fun you had over the summer. But with the addition of a heater, you could be enjoying all of the benefits of your brand new UNIQUE Arizona pool package and all of its features year round. To learn more about these five must-have features for your new swimming pool, contact the design team at Unique for a free consultation and to learn more about the process of bringing your dream to life. 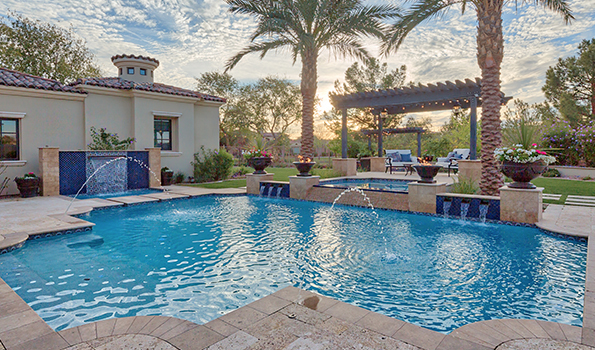 As a homeowner in Arizona, one of the most anticipated additions to any outdoor living space is a pool. It is a feature that not only will add to the function of your outdoor living area, but it can also greatly enhance the beauty of your yard. However, before you can move forward with your pool installation, you will need to be able to answer a few questions. This will help to determine the style of pool that will be best suited to your design taste as well as the features and functions that you might want to include in a pool. There are three primary design types when you are considering the shape of your new pool. An architectural pool is designed to mimic the style of your home with long straight lines and very sharp 90 degree angles. This look is more formal and modern due to the clean lines. Water features added to an architectural style pool are most often linear walls with sheer descent scuppers for a clean flow of water. Stone can be integrated into the finish of the water feature to match existing stone on your home, the color of your roof tiles or even pillars used in other outdoor spaces such as a Ramada or pergola. A classic or traditional pool is a very symmetric shape and is often used as a lap pool. Traditional pools are further broken down into two main groups. The Roman style begins with a rectangular shape but then the corners are rounded to add more interest. Often times half circles are added to the ends and occasionally to one of the long sides as well. This style of pool is sometimes also called a Courtyard Style. The other main style of traditional pool is called a Grecian style and rather than rounding the corners, these pools use 45-degree angles to create the corners. The Grecian pools tend to remain very geometric but are on a more elaborate scale than the Roman pools. 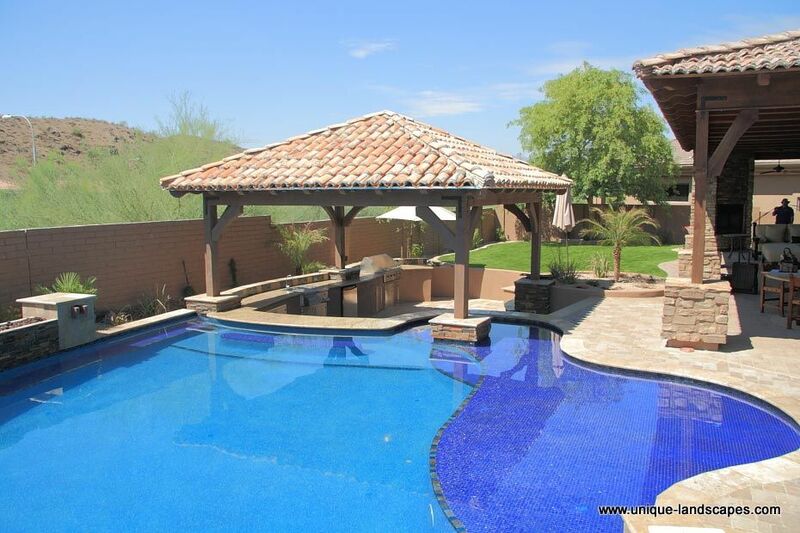 Freeform pools are the third major style of pool found in Phoenix. These pools feature many curves and smooth flowing lines to create a look much like that of a natural pond. This more casual style lends itself well to a non-traditionally shaped yard as it can maximize the available space. This style of pool can also feature a circular spa or even a circular table and stools in one of the curves of the pool. Natural stone water features blend well with this casual style but wok pots or sheer descent waterfalls can also be integrated into the design. With the style and shape of the pool selected, it is time to consider the additional features for your new pool. A Baja step is a large shallow area in the pool at the steps. This shelf is suitable for adding lounge chairs for tanning or relaxing. It is also a great place for children to play. Lighting is not a feature that you might feel is important initially, but it does make your pool very functional at night. When the temperature is still well over 100 degrees at night, a lighted pool is a fun and safe place to cool off. If you enjoy entertaining, then consider adding a swim-up bar to your pool as well. This is a great place for adults to gather and relax or for kids to enjoy a snack without having to leave the comfort of the cool water on a hot day. The size, shape, and features included in your new UNIQUE pool are almost unlimited. Be sure to ask your UNIQUE designer for feature recommendations or if you have any questions about something that will turn your new pool into your dream pool.